UNITED NATIONS, August 30 -- After the nerve agent phosgene was found in a UN office Thursday morning, the building at 866 East 48th Street was surrounded by crime scene tape. The sixth floor was evacuated. A press conference was held. Six hours later, a lone doorman logged visitors in, and the sign on the main third floor office of the UN Monitoring, Verification and Inspection Commission said "closed," referring those interested up to the sixth floor. There, however, there was a lone security guard, soon joined by another, both of whom said that no staff remained working. A slip-up reported worldwide on CNN, and all staff left before seven. Meanwhile, also on the sixth floor of 866 48th Street is the law firm of Fross, Zelnick, Lehrman and Zissu, P.C., which could not sue even if poisoned, given the UN's immunity. Upstairs in the same contiguous structure of a building of apartments, none of which were evacuated. The question here is not, as some spin it, that nothing happened in the 11 years the phosgene was sitting in this building. The fact that no one knew, and that the UN and diplomatic mission can bring weapons across borders without disclosure, putting them in buildings exempt from any inspection -- these are the problems. One wondered, as Thursday drew to a close, where was Michael Bloomberg? From Washington, spokesman Tony Snow shot off that "I'm sure there are going to be a lot of red faces at the UN trying to figure out how they got there." On CNN they said that phosgene smells like fresh cut hay. In UN Headquarters, the woman running the elevator between the basement and fourth floors said that her mother had called from, to make sure she was alright. Question: While UNMOVIC's been in that building, what's been its interface with either city, state or federal environmental agencies? Have you registered the things you have there? Is this the first interaction, I guess, with the host country or not? Mr. Buchanan: The first, yes. Question: So they've never inspected in the past. Is it the idea that it's somehow either immunity or international territory? Why didn�t they get involved? Mr. Buchanan: We didn't know there was anything hazardous in the archives. We have 125 cabinets with archives and they're under the OIC of UNMOVIC and in the process of archiving we went back to the historical files of the United Nations Special Commission (UNSCOM) and we discovered this. That's exactly what happened. We didn't know we had it. It shouldn't have been here. It should have gone to a laboratory. Question: Is there anything else? I remember previously, there were scud missile parts and gyroscopes and other things there. But is there anything else that would require you to register with the US Government or say that you brought it in? How does that work? Mr. Buchanan: No, I don't think so. Question: So it's not international territory? I just want to be clear. Unlike the building here, which the Fire Department couldn't inspect, you all have no legal issue of the host Government having access? Deputy Spokesperson: The point here is that we immediately contacted the host country as soon as we discovered this and that is the essential point here. But that wasn't the question. After asking the spokespeople there and other questions, and filing a first story, at 6:30 on Thursday Inner City Press and another correspondent set off for 48th Street. It was assumed that UMOVIC staffers, certainly its spokesman, would still be in the office. In the lobby the doorman asked casually where the two were going. "UNMOVIC." "Just be sure to sign in." On the third floor at room 333, a sign now said "Special Court for Sierra Leone," and directed UNMOVIC visitors up to Rooms 600 to 653. An elevator ride to the sixth story found the floor occupied by the law firm of Fross, Zelnick, Lehrman and Zissu, P.C.. The receptionist directed the visitors to walk to the other wing of the building, which they did. 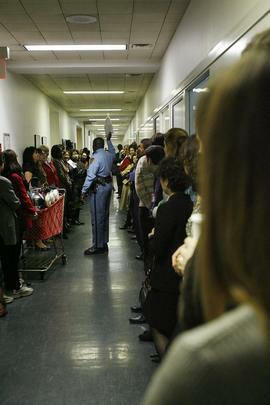 The door to 600 was locked, a lone UN security guard behind the glass. He radioed for another, who arrived. "There is nobody here," the journalists were told. "They have all gone home." It was well before seven o'clock. The building is like a maze, and unable to find the elevators, the journalists open the door to the staircase, which said "Exit." Once in the stairway, there was no way back out to the floors. Two long twisting corridors -- all labeled "Emergency Exit" with an icon of rushing man -- led finally to a door to 49th Street, which turned out to be alarmed. Out on the street, people were entering the same building, going up to their apartments. Even the journalists hadn't the heart to mention phosgene.